This really is a silly debate. The minimum wage should gradually be raised and then automatically increased for inflation. If we can do so for seniors on Social Security, we can do the same for young people. However, that doesn’t mean we jump to $15.00 even over two or three years. Yes, nine out of ten are age 20 or older, but 56% are under age 25 which is the breakpoint DOL uses for its own statistics. In other words in many, many cases we are not talking about heads of households. Tipped workers have a separate minimum, but must be paid the standard minimum if tipped income does equal the standard minimum. The DOL argues this isn’t good enough because employers ignore the law. It seems it would make sense to put tipped workers on the standard minimum thus removing all the administrative workload and eliminating any unfair labor practices and income variable. But again, this would not work if we moved to $15 an hour. The problem with the $15 an hour crowd is they do not consider the wider issues. An employer’s costs not only increase for the hourly rate, but for all payroll related taxes as well. That’s 7.65% plus any state taxes which means the actual rate for employers is over $16.00 and hour. In addition, they ignore wage compression. At $15 you must also raise pay (and payroll costs) for those currently earning $8, $9, $10, $11, $12, $13, $14, $15 and upward. At that point the prices for goods and services must be affected. This is a far bigger deal than proponents reveal. So if you champion $15.00, just understand the implications and consequences. Large employers may determine they can afford that expense and most already do, but for small and medium firms it is another story. It is micro economics 102, or intermediate income theory: Firms buy labor up to the point where the marginal revenue product (MRP) of labor is equal to the market wage. The marginal revenue product is the extra revenue a firm generates when they buy one more unit of labor (an added hour of work). As long as the income generated by extra hours of work equals or exceeds wages (total compensation) paid for the next hour of work, firms will be willing to buy more labor. Once the marginal revenue product of labor is less than the market wage, firms will cut back on the hours they buy at least until the marginal revenue product of the added hour equals the total rewards for that hour. Arbitrarily adding a minimum wage, a health care insurance mandate, mandatory sick leave, FMLA, etc. brings into play the law of diminishing returns – firms won’t hire nor schedule hours once the cost exceeds the marginal revenue product. So, the only meaningful statistic about who benefits isn’t that “nine out of ten are age 20 or older”. Nor is it the fact that “56% are under age 25”. So, less than 1/3 of non-incarcerated (non-institutionalized) teens ages 16 – 19 have employment (part time, full time, etc.) as of May 2016. And, of course, this blends both sexes and all races. BenefitJack note for emphasis: 4 of 5 black American men ages 20 – 24 are NOT employed!!!!!!! Young black men (under age 30) in the US with no high school diploma are more likely to be incarcerated than employed! 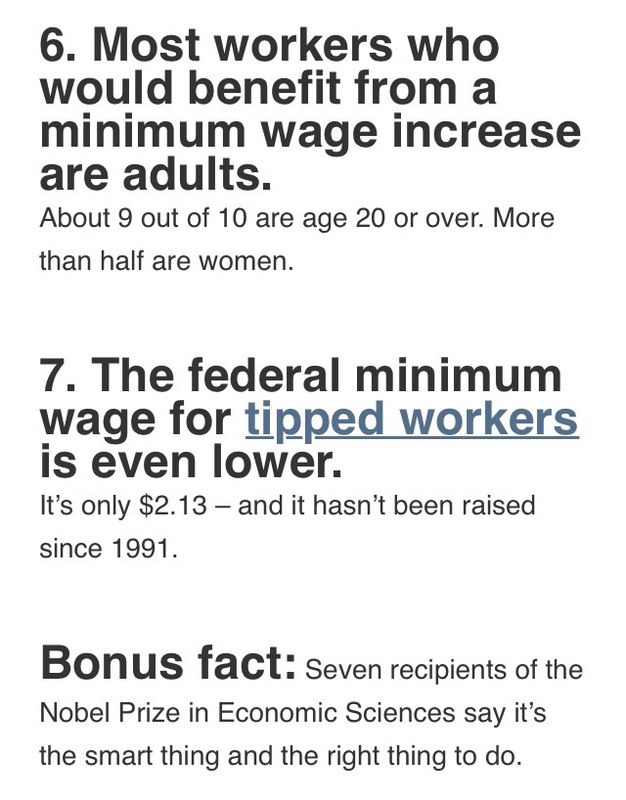 Think about that when Bernie and Hillary propose to raise the minimum wage from $7.25 to $15.00 – despite an already frightening level of underemployment, and unemployment and labor force (non)participation. Without corresponding, targeted changes in education and other facets of everyday life, a simple hike in the minimum wage to $15, standing all by itself, implemented overnight, OR over time, is a disaster for those it supposedly intends to help. Of course, the D’s and R’s all know this – yet look at the pandering for votes. Since I believe that this $15 hr wage will happen sooner than later depending on who gets elected; an interesting side note will be for the jobs that were “wage compressed” if benefits will return to the work place. Will it be cheaper for companies to offer benefits or perks rather than giving raises plus the additional +7.65% in various taxes? I do not see a return of pensions or medical insurance but maybe more time off or increasing 401K matches. Will the workers who get pay raises get benefit cuts to pay for the raises? I have been looking for a post retirement job for next year and the wages of what I consider skilled compared to what I consider unskilled retail / food service is way too narrow now. To think these unskilled workers want more than the skilled worker just blows my mind. I would love my pay to be doubled that way when I lose my I job I can cry how much money I was making before I lost my job and my unemployment benefits should equal that pay. I am looking forward to a mindless job that pays $15 / hr to ask “do you want fries with dat”. I probably could be a star employee in two months by just showing up everyday that I am suppose to. Of course the only way that I will be able to afford the food that I serve is eating the free meal given for working my shift. Cash is always a better deal for employers because they have more control and can even cut if necessary. Benefits generally are harder to control and subject to cost increases beyond employers control. I personally know that it is not to hard to cut a 401K match for a year or so. I am sure it helped the company but the end result so far has cost me $5k in compounding over time. If your job can be done by a robot at less expense to your employer…. It will be. Even if your employer would like to keep you on, his competitors will use robots and put him at a disadvantage. More and more at supermarket checkouts I see full service lines shut down and more self-service lines being used. It’s amazing to see how the customers are providing this free benefit to the supermarket for a service which used to employ human beings. You are certainly right that a large increase in minimum wage and the resulting wage compression that will follow will eventually lead to price inflation which will nullify the benefit of the increase but that might achieve the inflation that the central bank (Fed) has been trying and failing to do with monetary policy and quantitative easing. As far as what economists have to say… Economics is the only field where two people can say the exact opposite and both win a Nobel Prize.